A very special Ferrari 275 GTB/2 cam with factory alloy body – the car was delivered new to France in 1965 and at the beginning of the 70’s the car was sold to Fernand di Maria who used the car enthusiastically on a number of Ferrari France Club events – after which the car was looked after in the Marin/Pozzi Collection for years. This car has full documented provenance and is well known as the cover car in a Ferrari book by Antoine Prunet – where the car is extensively featured with it’s old registration K 94 under Di Maria’s ownership. In addition the car is featured in the Jess Pouret book about the 275. 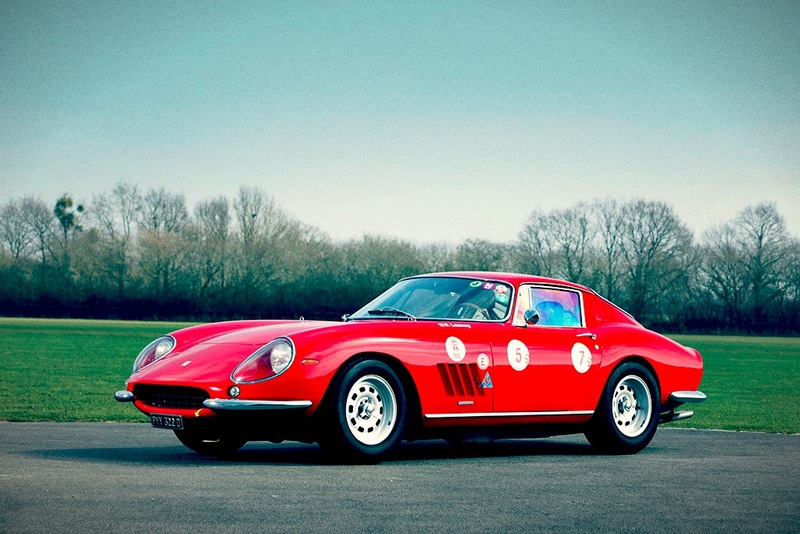 For the 1965 racing season, 4 lightweight 275 GTB Competizione Speciales were built and equipped with 250 LM engines. For the 1966 season, Ferrari decided to build 12 lightweight 275 GTB/C cars, they were constructed between the end of the 275 two-cam production run and the start of the 275 four-cam production run; even though they very much resembled the road-going 275 GTB, not one body panel was the same and underneath very little of the road car remained. Mauro Forghieri designed a special super-lightweight steel and aluminium version of the 275 GTB chassis. A regular suspension was fitted, but it was made slightly stiffer by the addition of extra springs. Scaglietti bodied the chassis with an ultra thin aluminum body; the panels were about half as thick as the ones used on the GTO and the Cobra – even leaning on the 275 GTB/C would dent the body; the entire rear section was reinforced by fiberglass to prevent it from flexing at the slightest impact. In all, this focus on saving weight made a difference of over 150 kg (331 lb) compared to the alloy bodied road cars.